This is a record of my tests to determine why I was experiencing low voltage from my generator set and the result of the tests including the actions that followed. 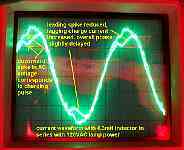 The images show phase relationships and harmonics. The variety of loads is very typical of a small communications room. 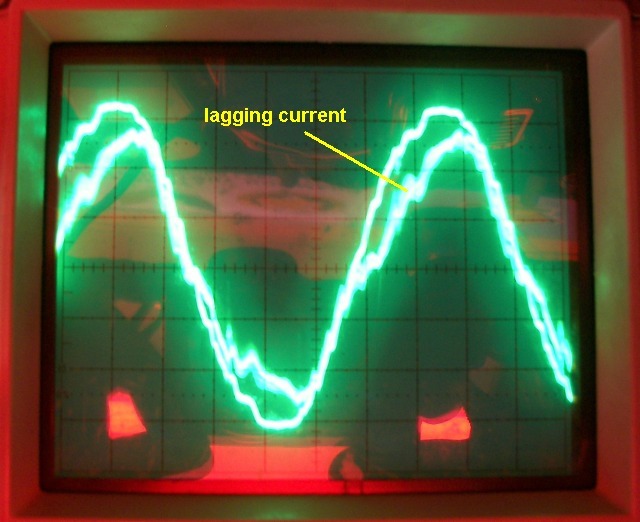 Currents where stated were measured with average reading clamp-on ammeter. 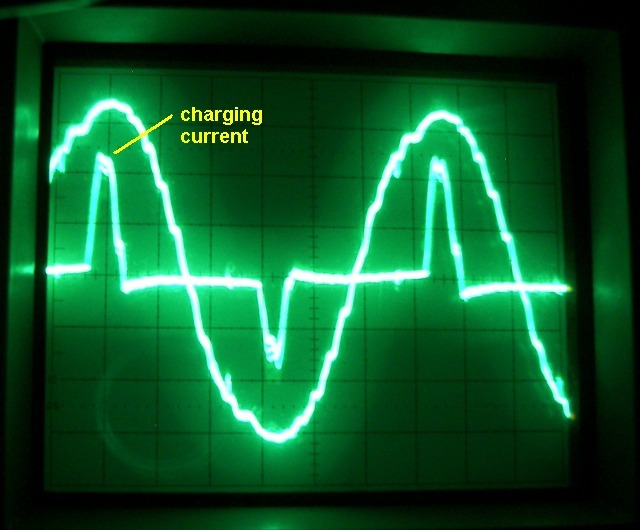 Waveforms obtained with current transformer. 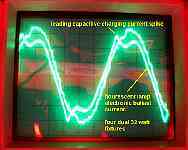 This was done as an experiment to determine if there is a problem with the loads in the system that is causing the generator to drop its voltage from 230V at no load to 216V at 2760VA. This is a problem since the set is rated for 5000VA (watts) with 5% regulation (5000W prime, 6000W maximum) and obviously somethig is out of spec if it cannot do well at about half load. In addition to examining the current and phase relationships of the load, the experiment also substituted different loads in different order to find out if a certain load was causing problems. It was noticed that the generator voltage dropped to 216V (108V for the 120V socket) when all the equipment shown was operating and the lights were then turned on. 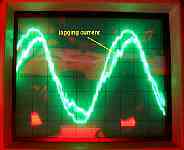 It was suspected that the lights were causing high-magnitude harmonic currents. 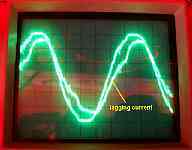 It's well-known that harmonic currents cause high I2R losses in the windings of an alternator. 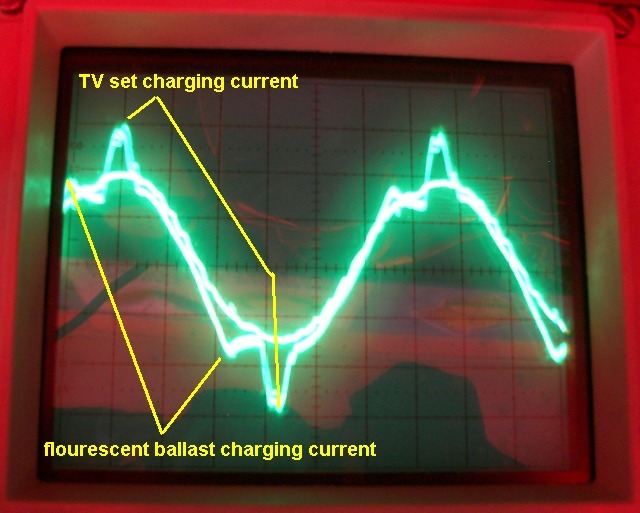 Instead, it was found that this was not a problem and the power factor of the ballasts is fairly good. 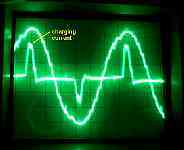 Looking at the voltage waveforms, it is easy to see where any problems, if any, would be. It was the incremental load that caused the voltage drop. Beyond a certain current, no matter which load was added, the voltage would drop. 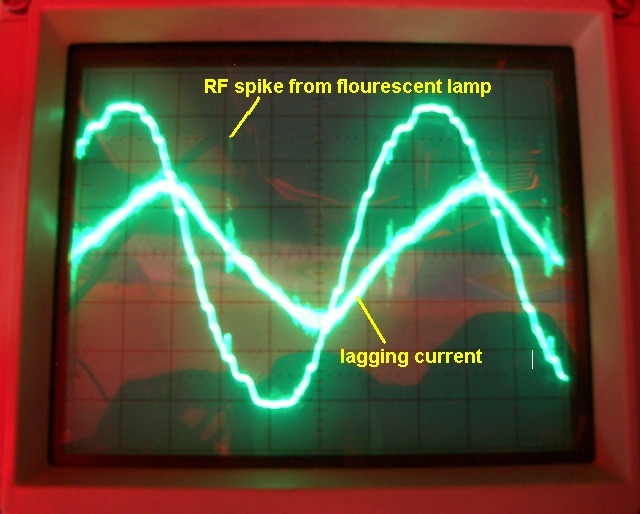 If the voltage drop with these imperfect loads occurred at full rated load, that would be understandable. This should not have happened at 1/2 load. These tests indicate that The generator needs to be tested with a purely resistive load bank. This is not an indictment of the generator, merely a reason for going to the industry-standard type of test (I did not have that equipment handy at the time). I didn't have to do those tests though. I discussed these tests with the factory, and sent them the pictures of the waveforms. I have to say the factory was very helpful to me in this matter. I was going on a road trip that would take me near Elkhart, IN, the home of Gillette Generators. I stopped by Gillette Generators and asked them to have a look. Talk about service! They sent the Tech support guy and also the fuel system technician out into the parking lot to check it. Sure enough, the speed was within parameters, but the voltage was low. It turned out to be the capacitor, a 50uF 330VAC unit. This capacitor is part of the exciter and regulator circuit. There is no solid state regulator needed on this model. 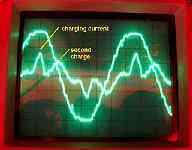 (A plus as far as I am concerned on a smaller unit, to have less complex mechanisms). So, the capacitor was replaced with a new type they have recently started using, 50uF/440VAC. Interestingly, both brands of capacitor are from very reputable American makers. In any case, I just had a bad capacitor, infant mortality. It must have died during the 100 degree day when I had the 3KW load for 8 hours.. It should not have, but again, just a bad cap, could happen to anyone. The owner came out and greeted me personally, and was very helpful during the tests -he is the real scientist behind the design of the alternators, and I do mean science. Everything he showed me bespoke years of experience and hands-on research resulting in continuous improvement. We tested the set extensively as I added more and more load and when I had the load balanced and maxed out (about 3300 watts is all I can draw with the shelter), they set the voltage to 120V. No load it is 125VAC, full load (which I probably will never see) I expect 115VAC. This is excellent! While I was there, I also bought an extension for the start/stop control and an oil drain adapter. They gave me a free service manual for the alternator (maybe because I had gone into enough detail regarding the symptoms? -well I am very glad to have it, I enjoyed reading it actually. Before I left, I was also given a spare capacitor, just in case there was any sort of trouble again. Right now, I doubt I will need to use it, but it's good to have on hand when going into the field. The owner gave me a tour of the facility. I am impressed how modern and automated it is. The metals of the laminations for both stator and rotor are specially treated, but in different methods. The stator of the generator set is made of a special steel alloy designed to remain magnetized, so no exciter re-charge is ever needed. The rotors are specially shaped and have a pitch to reduce harmonics and make cleaner power, and are also fitted with special damping bars to direct the flux lines accurately to the correct poles as the machine rotates. There are some details/techniques I was not shown but none of it is magic, just hard physics. All of the copper is 100% pure copper, not alloys like some units use -and these sets have -alot- of copper in them for their KW rating. I suppose that is why it starts my big 12000BTU air conditioner so easily, even with everything else running including the 8000BTU air conditioner. The ends of the windings where they come together electrically are ultrasonically welded, not crimped as with many competitors (I know because I have taken many sets apart to rewire or fix them). The weld can be seen to be a real weld, not just a hard contact that was crimped. All of the operations are done with precision special machines so there is no chance of nicking the wire windings as they are inserted into the stator The insulating material between the windings and the stator is an impregnated-like glass-mylar-glass material, very nice! Besides the various tests along the way for QA, each completed unit is 100% tested for frequency, power, and voltage before shipping. The whole operation is high tech, very clean environmentally, and employs good American people to make the machines there in Indiana. I am very impressed by the excellent customer service from Gillette Generators as well as the overall quality of the unit. The engine is a Lombardini Diesel (an Italian make with a long history of good service). I would reccommend Gillette products to anyone needing a dependable set backed up by an American factory and expertise. Gillette has servicing dealers in many major cities, so I could have taken it in here in Dallas, but had put it off since I did not have time off work to spend a day there with the truck. On my road trip, time was my own and Elkhart IN is on the way between two of my destinations, Lima OH and Chicago IL. 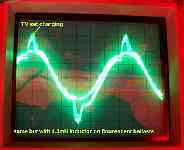 12000BTU air conditioner's condensing unit current waveform does not lag too badly due to capacitor run motors. 11 Amps. Four electronic ballasts, each running two 32 watt lamps. 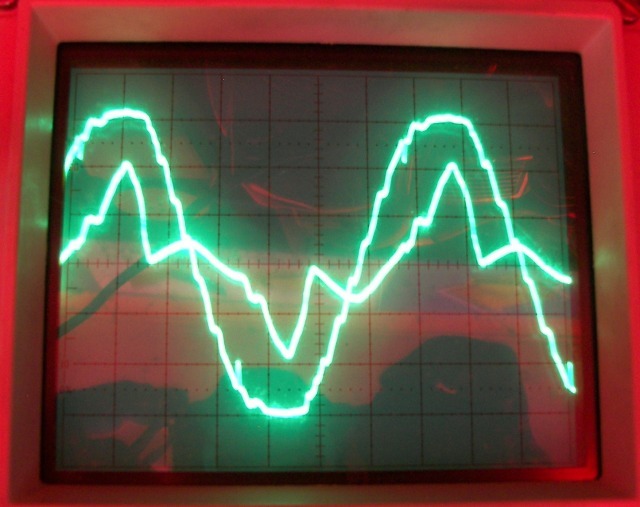 These are labeled as "high power factor", but the current waveform is not so perfect. Note the initial charging spike followed by a broader secondary current pulse. 2A average current. A 4.3 millihenry inductor was put in series with the 120VAC to the flourescent lamps as an experiment. 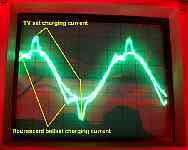 It reduced the initial charging current. It reduced the average AC voltage to the ballasts by 18VAC and did not change the current more than 5%. TV set plus fourscent lamps with inductor.